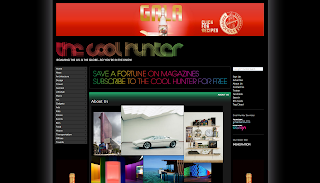 A beautiful site full of inspiring design from around the globe, founded and led by Bill Tikos since 2004. As winner of the 2007 and 2008 Webblog Awards for Best Culture Blog, this site has spawned an ever-expanding brand that has moved into consulting and agency services for product design and developement, brand development as well as graphic design. Among the current topics of culture on the site itself are news, architecture, design, travel, fashion, lifestyle, music, art, gadgets, ads, kids, stores, events, bars, food, transportation, offices and treelife, with online hotel bookings, residential property listings a plus a few others to soon be introduced. This site is a bright and awe inspiring. Perhaps a little pretentious for some, but definitely worth a look!